Balancing the Bucket: Wow, Memes are Us! I had a few people request for an Autism itself meme, and I couldn't resist. Advocacy? Something I'm passionate about? Absolutely happening!! What my friends think I am- This part makes me sad. Actually, a lot of this meme makes me sad. But the final part makes it worth it, so bare with me. I chose to do a kid that was getting teased/gossiped about. I see this waay too often in my job, and I HATE it. I actually make the kids that tease a student with autism come in at lunch to do an autism awareness lesson that I've designed for this sole purpose. Awareness, kids!!! What society thinks I am- Rain Man! The biggest autism stereotype there is, right!?! What the government thinks I am- Another advocacy pic. The sign reads, "Toxic Vaccines? Just ask me!" Which I think shows how this controversial topic effects our kids with autism personally. What I think I do- I used a junior scientist observing a stack of pennies because of our kid's way of looking at the world in their own unique way. The stack of coins... well, it reminds of how Cay lines up his dinosaurs and sorts everything he can get his cute little stubbers on. I also received a request for Autism Dads, so stay tuned. This one shall be interesting... as I have NO CLUE about this wonderful, but rare, breed of guys! Any ideas?? This warmed my heart. 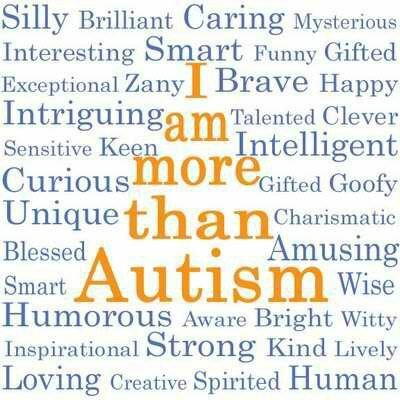 My brother has high-functioning autism and he is treated like this by many people. It speaks the truth and I'm glad I've found this.